Aneta Stępień holds a doctor degree in Comparative Literature (2014) from the University of Surrey and MA in Polish Studies from the University of Warsaw, where she also obtained a diploma of Polish Lektor. She has been teaching Polish since 2003, working with refugees for PAH (humantiarian organization) and teaching at the Polnicum Centre at the University of Warsaw. 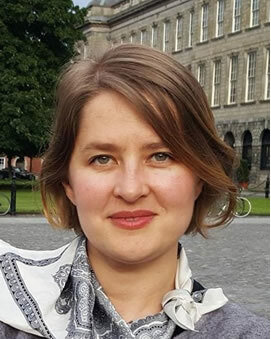 Before joining the Department of Russian and Slavonic Studies in 2013, she taught at the University of Surrey and, between 2007-2010, at the University of Glasgow. Her teaching in Trinity includes contemporary Polish literature and film, business Polish and translation, and European Studies. Currently she prepares a book Shame, Masculinity and Desire of Belonging, a comparative study of shame in the novels by contemporary male writers. Her main research areas are Gender Studies, Polish Literature (19th and 20th century), Yiddish Studies and language, and communism, in particular the history of the Polish Republic of People (1945-1989). Her most recent project focuses on gender relations and sexuality in the prose of Isaac Bashevis Singer as well as the literary culture in the inter-war Poland and its impact on Jewish writers. The project has been developing thanks to the support of two research grants: 2014 New Foundations by the Irish Research Council and 2015 Long Room Hub Research Incentive Scheme, which among others enabled the visit in Singer’s archive at the University of Texas. Current Erasmus coordinator for exchange between Poland and TCD.